Galleons ride the Norfolk coast like tributes to the sea. This land has taken its living from the ocean, but if the North Sea looks after its own, it also takes its terrible toll. All along this coast the evidence of incurcions scars the land, a scrawled memory of the dead. As recently as 1953, dozens of lives were lost when the stormy waters broke through. 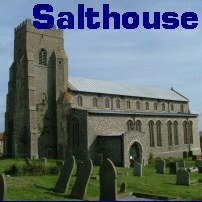 Salthouse church became an island, the villagers rescuing what few possessions they could and hauling them up to the one secure building in the parish. It must have always been so. 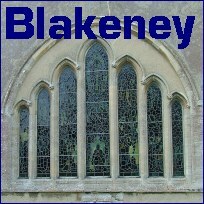 Blakeney church too stands high above the tide line, ready, waiting. Over the centuries, so many more lives were lost on the waters themselves, and these losses are remembered again and again in the churches. But the churches themselves are ships, riding the swell of the coast. Where did the money come from for these massive 14th and 15th century rebuildings? The wealth of England in the late Middle Ages was, as at any time in history, concentrated where raw materials could be found, and goods could be processed and exported. In the 15th century this meant, above all, cloth woven from wool. The markets abroad were accessed through Flanders from east coast ports, of which there were many. But the success of these east coast ports created a market of its own, and this needed to be provisioned, not least from the fishing stocks of the grey German Ocean. The great port of Blakeney Haven stretched from the river mouth between Cley and Wiveton as far east as Salthouse quay, a medieval conurbation run by hard-nosed business men who employed local people in their hundreds on the boats and the port sides. Because of the connection with the continent, Dutch was probably as widely spoken as English, and foreign, even black, faces would have not been an unfamiliar sight in the streets of Blakeney and Cley. The wealth of these great merchant houses was new money. 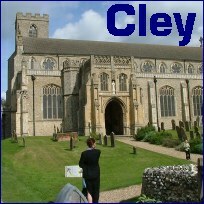 As England was a Catholic nation, the merchant classes prioritised prayers for their souls after their deaths, and left bequests in the form of chantry money and wills that would rebuild the churches, filling them with screens, roods, altars, images and glass that not only asked us to remember them, but asserted the official doctrine of the Catholic Church. It is almost unimaginable today. 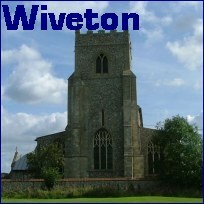 It is, perhaps, possible to stand in Wiveton churchyard, gazing across to Cley, and comprehend the harbour mouth between the two. Now, it is all pasture land and copses. Further up river, the quayside at Blakeney is still easy for the mind to populate with busy merchants and traders, but Salthouse is now a lonely outpost, far from anywhere really, only the wheeling seabirds giving it sound above the rushing of the wind from the water. Blakeney Haven is not alone in being a major English port now lost to us - but there was another factor here that made it an even more significant place. Barely ten miles inland is the great shrine of Walsingham, and Blakeney Haven was the nearest port. 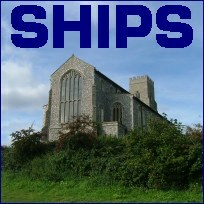 In days when it was easier to travel from London or Bristol by sea than by land - indeed, easier to travel by sea from even Ipswich and Norwich - a significant proportion of boats putting in here must have let off pilgrims, brushing themselves down, stretching, ready for the last leg of their journey via Binham Priory to Walsingham shrine itself. All this came to an end with Henry VIII's greedy supression of the monasteries in the 1530s, and pilgrimage itself was dealt its death-blow by the fortunately short-lived protestant impositions of his son Edward VI. But it was not just Catholicism that was lost to the Norfolk countryside. The English Reformation created an insular country that sat ill in an increasingly disunited Europe. At Salthouse, graffiti of great sailing ships remind us of what bored clerks could see from the window during those interminable sermons, the galleons that the pirates Drake and Raleigh used as they plundered the wealth of the New World and of Spanish traders. But these great boats were headed for Lynn and the Humber, not for Blakeney Haven, which became increasingly sidelined. By the late 17th century, it was as profitable to use the land for grazing pasture as for trade. Local landowners began to dam the river for rich saltmarsh, and canalise it for irrigation. Norfolk farming was at the forefront of world agriculture, but at a terrible cost, for the river silted up, and first Salthouse and Blakeney, then Cley and Wiveton at the river mouth, fell into decay. Today, these great churches bear witness to their glory days, but also to the generally admirable efforts of the Victorians in rescuing them. They are, of course, wholly unsuited for the present needs of the Church of England, but all four are successfully finding ways of being, and in doing so of surviving, and finding a future. Today, this coastline is busy again, but the visitors are tourists and holiday-makers. The North Norfolk coast is fashionable and expensive, but when you look at the horror that is Yarmouth, Hopton and the east coast of the county, it is a preferable option. And the presence of so many visitors has encouraged all four churches to be open everyday, for which we can be thankful, if a little wistful when we conjure up what we have lost. Thanks To Tom, as ever, for making my visits to these four churches possible.